It is that time of year again when my garage looks more like a distribution warehouse than a garage. I just finished sorting out and shipping this year’s prizes to all of the generous ambassadors, who make these great events happen by volunteering their time. This is our third year of the Hometown Throwdowns and we continue to get bigger and better each year. Let’s get started with the prizes, because I know that is what most of you really care about. I am pleased to let you know that all of our strongest supports are back again even in this terrible economy. Immersion research, Jackson kayak, Smith Optics, and Mtn. Khakis have been supporting the Thowdowns from year one. They were willing to take a chance on an idea and a hope to do something great for the different kayaking communities across the globe. Thanks for your foresight. Without it we could have never gotten this thing off the ground. Rapid Transit Media is back on board for a second year and for all you WK members out there keep your eyes open. There will be a special deal coming for you from Rapid Transit. Last but certainly not least, I am very pleased to announce that Kokatat has joined forces with WK this year. Make sure you get out to your first local Throwdown of the year to see what we are doing with the Kokatat prizes. When we first started the throwdowns we managed to host 65 events in our first year. Last year we put together a series of 135 events! That was a big jump to say the least. We are looking to improve upon that a bit for this year as well. We will be returning to all of the communities that we were active in last year, and we will be adding a bunch more. This year you can see new regions all over the place. We will be hosting new regions from Kentucky and Scudder’s Falls in the East to The Hydrotherapy sessions in Spokane Washington and Bend Oregon in the West. We will also be hosting a number of events in Texas and Oklahoma! WK is also fortunate enough to have the opportunity to partner with a number of fantastic events. We have been partnered with the original Maryland Chute Out, this is where it all began, and the Golden Community Series since we got started. We also partner with a number of other community events around the globe. This year we are also getting involved with the Professor Paddle Ball and the Hydrotherapy Sessions in Washington State. Not only have the number of events that our ambassadors host grown, but last year we started to mix things up with the style of events we run. This all started a few years back at the WW Symposium in Maryland. James and I were there to introduce WK to the leaders of the educational kayaking community. For the first two days of the event Joe Jacobi kept harassing me to attend his Slalom Survivor workshop on the water. I kept saying yeah we will see, and honestly I was not sure what I would be doing in that time block. In the end I decided I needed to get out of the classroom and get on the water. That was one of the best decisions I made at that particular symposium. I was introduced to Slalom Survivor, and I had the most fun in a kayaking event that I had had in a long time. As I participated it was really cool to see that Joe had done a similar face lift to slalom as we had done to freestyle. 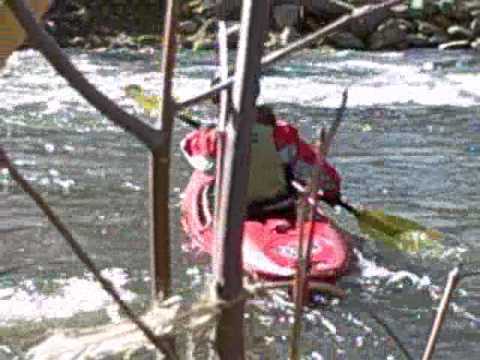 Take a look at this great video Joe and Bob put together that explains slalom survivor. Last year WK ambassadors hosted close to 40 slalom survivor events that were part of the Hometown Throwdowns. It is about time for me to stop rambling about kayaking, so I will leave you with just a few more thoughts. I am amazed at the generosity of our ambassadors who volunteer their time to help make their kayaking communities a better place. This spring alone I have had 5 more boaters contact me asking how they can get their community involved. I know that I am a selfish boater and I enjoy my time on the river. It blows my mind that with nothing to gain from getting involved they keep on coming and stay involved. I am proud to work with all of my ambassadors to bring you this year’s Hometown Throwdowns. Go to www.worldkayakblogs.com/throwdown to see what is going on in the throwdown world and to register for an event close to you. Welcome to Worldkayakblogs.com. This is your first post. Edit or delete it, then start blogging!